Part two of my Clarion series. You've been accepted into the workshop! (Or you haven't but you definitely will next year, or the year after – keep at it!) Besides running around flailing with excitement, what else can you do to squeeze more out of the experience? As I've mentioned before, each year is different, so not all of these will apply to you. You may also be short on time or resources. If that's the case – don't worry! You'll be able to carve out your Clarion experience. But I wanted to share some advice that did prove valuable to me, in the hopes it may help you. Some of them will have a whole row of books you can borrow from the library. Some of them will mostly have short stories. There will almost always be free things you can read online, but occasionally their work will be behind a pay wall. However, all of your instructors will have published work and received some major recognition in the field. Reading the teachers' works helped me to ask tailored questions during our one-on-one sessions. It also gave me a better understanding of where they were coming from when they gave critique. Your favorite writer may not be your favorite instructor – and that's fine! Let the instructors surprise you. They all have something important to share, and even if your styles or ideas about craft don't jive, you can learn something from each of them. If you're writing at the skill level that earns you a Clarion acceptance, you may already have an idea about this. You will also probably be asked to introduce yourself or answer some questionnaires for room assignment purposes. In any case, I think it's important to at least take a moment to recollect what you know about yourself as a writer: your strengths, weaknesses, preferences, squicks. This will come in handy during workshop because all of these things will be challenged (some of them repeatedly). If you have a sense of them beforehand you'll be better equipped to manage your expectations and emotions, as you're struggling through the writing and feedback. Me with Andy Duncan, AKA the best week 1 instructor evar. When I first arrived at UCSD, one of our program coordinators told me her One Piece of Clarion Advice: “If you have a choice between working on your writing and spending time with your other workshop mates, always choose the latter.” (Thanks, Jessica!) It sounds contradictory because we're all in the workshop to write. We all have our writing assignments to finish, not to mention a pile of critiques to annotate. But. But. You will not get this time with your workshop mates again. Even if all eighteen of you manage to orchestrate a reunion, it won't be the same (and not necessarily in that terrible sad way that this sounds like - it'll just be different). You won't have the physical location and the actual situation of Clarion, ever again. So do make the effort to get to know your workshop mates. It will be rewarding. And honestly, many of them will be tremendous resources as you move on in the writing biz, post-workshop. That being said, if you need to take a break, do so. By all means. Have your alone time. Wander off campus. Say no to a dinner you truly don't feel like going to. Make the effort, as much and as often as you can – but always keep track of how you're feeling, and listen to your gut. You don't want to burn out! 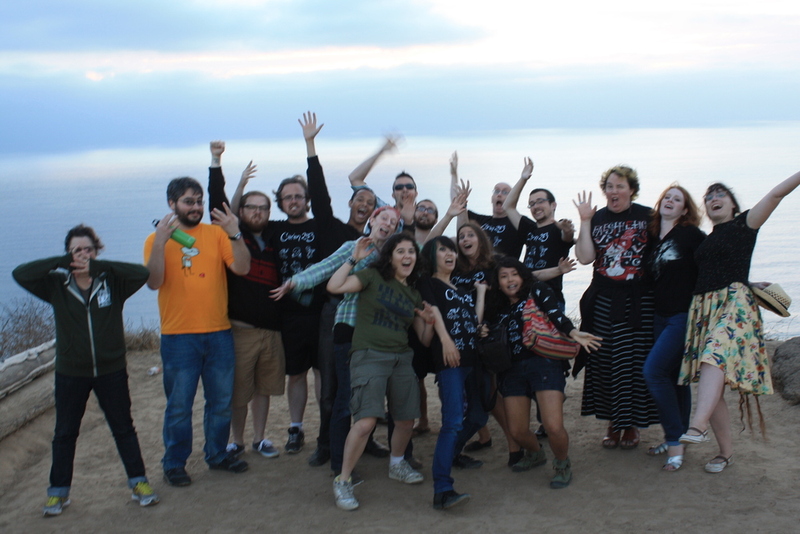 You can go take a sunset walk by the cliffs and stare at the pretty sea, like Cory Doctorow encouraged us to. You won't be getting a ton of sleep at Clarion. The cafeteria food improves every year, but it isn't the healthiest around. And writing, editing, and critiquing are all stressful in their own ways. After reading about how intense workshop was, I was prepared to be seriously fatigued. Through some combination of care and lots of hot tea, I surprised myself by not getting sick at workshop. I never even pulled an all-nighter (though I came really close to it at times. And it's possible I was in the minority.) Missing a day of workshop is terrible, but missing half the week because you couldn't get out of bed is worse...so keep a pulse on how your body is feeling and try not to overdo the stress on it. Be wild and bold. Push yourself. If you read submission guidelines you will find that they will sometimes ask for “the stories it scared you to write” (hi, Apex). You can use a week or two (or three) to show your class your favorite type of story: what defines you as a writer, what you excel at (or, given that we all have confused egos, what you think you're decent at). But you may be surprised to find that your writing sparkles in other types of stories, too. Go for the teapot (I mean this literally...there will be some hot-water-makers...the one for my suite was indispensable). You can draft a list of plots, but you probably won't use most of them. Keep a Clarion diary if you are so inclined. I did and it helped me a ton. Try to go to the Mysterious Galaxy readings. They are awesome. Enjoy yourself. In the midst of your brain imploding with all you're learning about yourself, writing, genre, the publishing world, etc, etc - you should be having fun. Have a blast. If, like me, you sometimes like writing longhand - the UCSD bookstore has sweet pens. 8. You need to let all the things you learned at workshop sink in. This might take time – maybe more time than you want it to. It can take a few weeks, or even a few years. You-post-workshop has more knowledge and sharper writing skills than you-pre-workshop. You may find yourself writing things you're not satisfied with. You may find that you've grown by leaps and bounds. You might not feel it on the last day when you're high on tears and goodbyes, and all the amazing things that exploded your mind about writing/yourself/genre/the publishing scene/sff/etc during workshop. But when you're sitting in the airport, or when you get back home, you'll be tired and sad. You'll have a giant stack of marked-up manuscripts that will seem colossal. You may have this sense that some of your stories will be unsalvageable. And you will hear that odd, sadistic chanting in your head that workshop is over, over, over. Workshop is a giant transition period for most, if not all, attendees. In 2013, some of us had just graduated from college; some of us had quit our jobs; some of us had just gone through a big move. Real life will be a shock of cold water. It'll be rough. There will be lots of things to arrange, to slide back into, and the outside world will not really know how different you are now. Be kind to yourself as you go about this. 10. Hop back to work. Write, finish, revise, send stuff out. Your teachers have told you to do this. You now have a better grasp of the markets that are out there. Start reading submission guidelines. Flail at your co-workshoppers about cover letter etiquette and turnaround times. Get your work out there. It is *your duty* as a Clarion grad. Do “the work” of writing. Yeah. You'll hear some variation of all those things, and not all of them are compatible. My take: you need to do what works for you. I did some combination of all these things. I gave myself a break, but I also promised myself I wouldn't quit writing, that I'd take it seriously, that I wouldn't let go of it even if major real-life stuff was happening. I worked on the stories I felt reasonably good about, and put aside those that I couldn't tackle. I haven't given up on them yet, but I haven't been able to do the work on them that needs to be done...and some of them may need to mutate a couple of times before they are submission-worthy. After writing five short stories in the span of six weeks, it took me months to finish another story, and it was really hurty and draggy and gross while I was writing it. But that's okay. I am slowly figuring out how to worm writing into my life. In fact, the most important thing is that now I've settled my brain battle as to whether writing is something I need to do. Just to have that resounding yes in my brain means so much to me. Back at the cliffs on our last day...trying not to fall over the edge. That's it for my Clarion advice! Any additional posts I write on this topic will be more about my own, personal experience on Clarion 2013. Until then, congratulations class of 2014, and all subsequent classes – I hope to have the chance to meet you guys and read your work in the near future!